New York: Peter Blum Edition. A 2 volume set. Volume I: A previously unpublished story by Arthur Miller accompanied by 10 actual-size color reproductions of etchings by Louise Bourgeois, a duotone photograph of author and artist by Inge Morath, and publisher’s note by Peter Blum. 40 pages. Volume II: Contains the same story printed in grey with red highlighting and 8 full-color photo collages by Louise Bourgeois. 38 pages. Edition of 1200, 78 pages total, 10 color reproductions, 8 full-color photo collages, letterpress, cloth hardbound with slipcase. There is an edition signed by Bourgeois, Miller and Morath available. 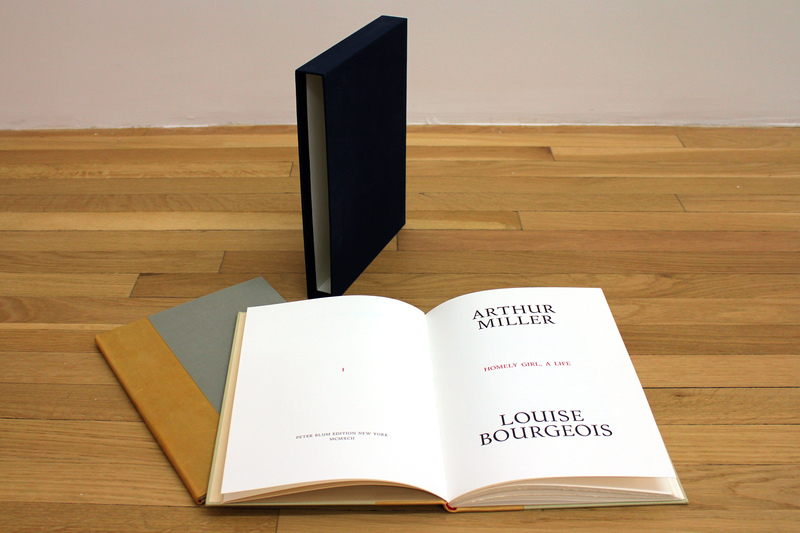 There is also a special edition available limited to 100 copies, with ten original etchings by Louise Bourgeois, which is signed by author and artist. Hardbound in leather and cloth with cloth slipcase.